1. Suppose the natural rate of unemployment is 6 percent. On one graph, draw two Phillips curves that describe the four situations listed here. Label the point that shows the position of the economy in each case. a. Actual inflation is 5 percent and expected inflation is 3 percent. b. Actual inflation is 3 percent and expected inflation is 5 percent. c.. Actual inflation is 5 percent and expected inflation is 5 percent. d. Actual inflation is 3 percent and expected inflation is 3 percent. 2. Illustrate the effects of the following developments on both the short run and long run Phillips curves. Give the economic reasoning underlying your answers. 3. Suppose that the economy is currently at full employment and investment rises. a. Illustrate the immediate change in the economy using both an aggregate-supply aggregate demand diagram and a Phillips-curve diagram. What happens to inflation and unemployment in the short run? b. Now suppose that over time expected inflation changes in the same direction that actual inflation changes. 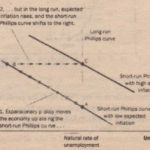 What happens to the position of the short-run Phillips curve? After the expansion ends, does the economy face a better or worse set of inflation unemployment combinations? 4. Suppose the economy is in a long-run equilibrium. a. 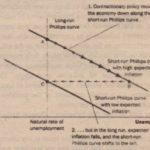 Draw the economy’s short-run and long-run Phillips curves. b. Suppose a wave of business pessimism reduces aggregate demand. Show the effect of this shock on your diagram from part (a). If the Fed undertakes expansionary monetary policy, can it return the economy to its origin ,I inflation rate and original unemployment rate? c. Now suppose the economy is back in long-run equilibrium, and then the price of imported oil rises. Show the effect of this shock With a new diagram like that in part (a). If the Fed undertakes expansionary monetary policy, can it return the economy to its original inflation rate and original unemployment rate? If the Fed undertakes contraction monetary policy, can it return the economy to its original inflation rate and original unemployment rate? Explain why this situation differs from that in part (b). 6. Suppose the Federal Reserve’s policy is to maintain low and stable inflation by keeping unemployment at its natural rate. 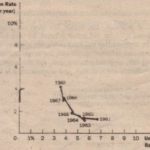 However, the Fed believes that the natural rate of unemployment is 4 percent when the actual natural rate was 5 percent. If the Fed based its policy decisions on its belief, what would happen to the economy? How might the Fed come to realize that its belief about the natural rate was mistaken? 7. Suppose the price of oil falls sharply (as it did in 1986 and again in 1998). a. 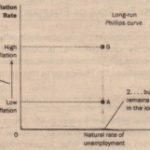 Show the impact of such a change in both the aggregate-demand aggregate supply diagram and in the Phillips-curve diagram. What happens to inflation and unemployment in the short run? unemployment? Why or why not? 8. Suppose the Federal Reserve announced that it would pursue contractionary monetary policy to reduce the inflation rate. Would the following conditions make the ensuing recession more or less severe? Explain. a. Wage contracts have short durations. b. There is little confidence in the Fed’s determination to reduce inflation. c. Expectations of inflation adjust quickly to actual inflation. 9. Given the unpopularity of inflation, why don’t elected leaders always support efforts to reduce inflation? Many economists believe that countries can reduce the cost of disinflation by letting their central banks make decisions about monetary policy without interference from politicians. Why might this be so? 10. Suppose Federal Reserve policymakers accept the theory of the short-run Phillips curve and the natural-rate hypothesis and want to keep unemployment close to its natural rate. Unfortunately, because the natural rate of unemployment can change over time, they aren’t certain about the value of the natural rate. What macroeconomic variables do you think they should look at when conducting monetary policy?